All of the water South Fork uses goes through a 14 step reverse osmosis water filtration process to become purified before being bottled. 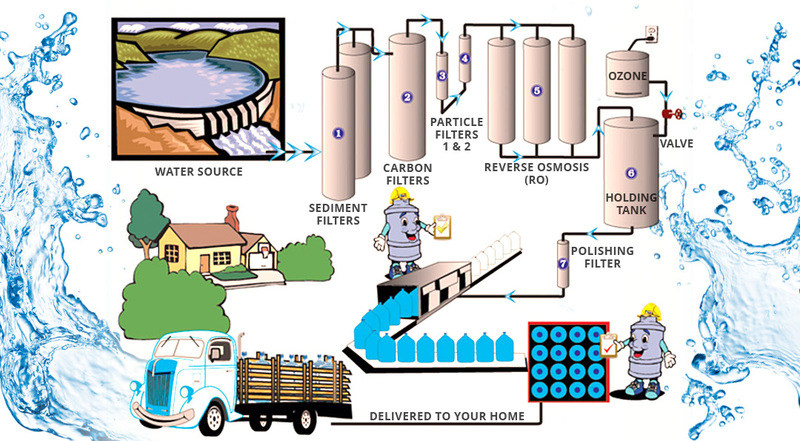 Reverse osmosis involves a semi-permeable membrane through which water is forced. Because soluble particles like salt are larger than water molecules, the membrane blocks the impurities and only clean, fresh water is collected on the other side. The advantages of reverse osmosis include the removal of minerals and chemicals present in regular tap water. In addition to salt, reverse osmosis also removes lead, manganese, iron, and calcium. Reverse osmosis also removes fluoride, which has been linked to chronic kidney disease by the American Dental Association. Bottled water filtration and purification including reverse osmosis is regulated by the FDA. The FDA requires bottled water companies adhere to strict regulations in reverse osmosis processes. Our bottled water is tested on a regular basis and has always passed the requirements, staying well under the recommended guidelines.